This collection of classics from the BFI maintains their ongoing commitment to preserve Britain’s film heritage for generations to come. Accompanied by a fascinating and detailed collector’s booklet, Runaways includes three films from the Children’s Film Foundation featuring young boys who, in various ways, run away from home, only to find themselves in trouble with their elders in the form of their parents and the law. 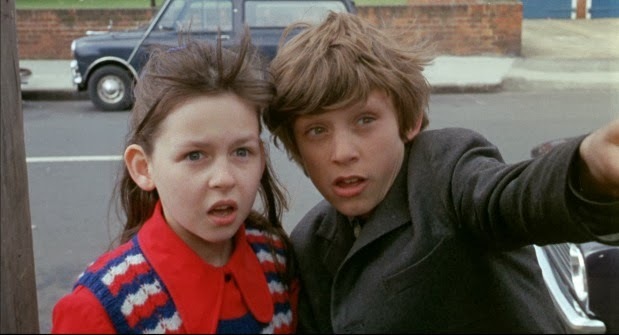 Johnny on the Run (1953) filmed on location in Scotland, and Hide and Seek (1972) and Terry on the Fence (1985), both shot in London, are ideal examples of a moralistic form of entertainment popular with children in the past, but seldom seen in today’s ‘enlightened’ age. In Johnny on the Run, young Polish refugee Jan (Eugeniusz Chylek) runs away from his aunt with whom he has been sent to live in Edinburgh. After falling in with a couple of petty criminals Jan (or Johnny as he is known) finds himself in a rural village which is home to a host of foreign refugee children who befriend Jan and encourage him to stay. Whether he does, and whether or not he manages to escape the clutches of the thieves may be pretty predictable, but the film and its depiction of rural life in Scotland has a charming air of whimsy and nostalgia. Hide and Seek sees a boy called Keith (Peter Newby) – or the Deptford Dodger as he is known – hiding out in a derelict house after running away from an ‘approved school’ in the hope of finding his father. Befriended by a couple of local kids, Chris (a young Gary Kemp) and Beverley (Eileen Fletcher), Keith tracks his father down – though soon wishes he hadn’t after discovering what line of business dad is involved in. In the final film, Terry on the Fence, the young Terry (Jack McNicholl) falls in with a gang of rough teenagers, after he runs away from home following a row with his mother and elder sister. Things work out ok of course, but not before he has the statutory run in with the law and local powers that be. Apart from being a showcase for both young, aspiring talent as well as the better known older members of the casts – including John Laurie, Mona Washbourne, Liz Fraser and Robin Askwith – the three films share others memorable factors. Not only are the children in most cases more sensible and level headed than their elders, but they appear to have an underlying moral code missing from much of today’s younger generation. If parents now wanted to give their children a basic grounding in the difference between right and wrong and that crime, in the long run, doesn’t pay, they could do worse than to show them the films included here.